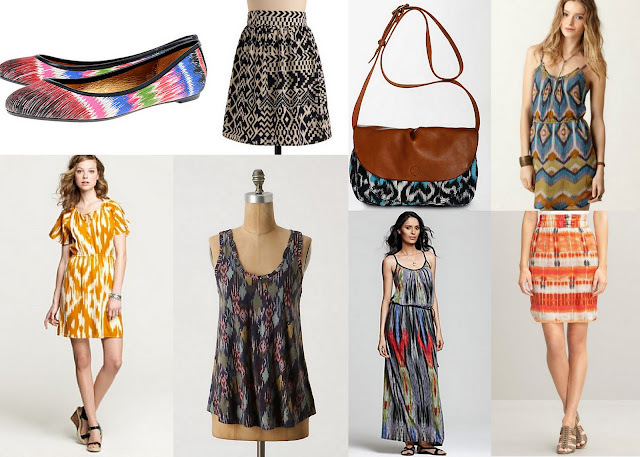 Ikat, aka that strange kind of Aztec looking print, has become very popular for this season. Now, we had never even heard of Ikat until recently, but from what we understand it is not really the print, but the method of weaving. Ikat is created using a process very similar to tie dying by tying off bundles of fabric and then dying them. The process creates these patterns and they can be done in one color or, more often, many colors. These days it's kind of hard to pull off tie dye, but an Ikat print can give you similar blurred lines and a carefree look in a way that is still totally sophisticated.